1981-84 Iowa Motorcycle Inspection sticker - $20.00 : Bob Hoyts Classic Inspection Stickers, Add a Final Touch to your Restoration! 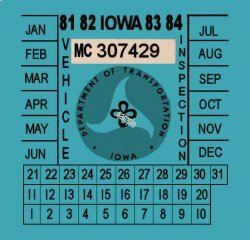 This 1981 to 1984 Iowa Motorcycle Inspection sticker was originally issued for four years but was good for only one year. The Inspection station punched the appropriate year, month and day. Buyer can do the same. This sticker was restored and reproduced directly from an original. It has our patented "Peel and Stick format It has been Laser printed to last longer and help prevent fading. It attaches as a standard sticker to the gas tank or motorcycle bracket.